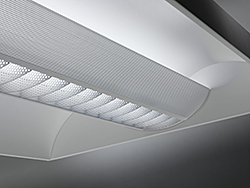 Stratus-E series' light distribution highlights both horizontal and vertical surfaces. It features more balanced curves, fixture efficiencies of up to 86 percent, a keyhole-mounted cover over a center wireway and a lighter, easier-to-handle body. A curved light seal assures a clean, tight edge between shielding and housing.